Details, details, details. Dismiss them at your peril, as we were reminded today as we considered next steps on the 1959 Chris-Craft Sportsman preservation project. A series of strikes using a rubber mallet confirmed John’s suspicion that the fasteners in these areas had backed out a bit, lost their bite into the underlying frames or battens, or simply broken. Even more mystifying was the fact that the bungs lacked the telltale black rings that signal adhesion failure, but when he touched them with an awl, they simply released completely, falling on the floor. Note to selves: Pay closer attention to bungs and how the planks are lying relative to one another. As the clip details, and we have now addressed, the fasteners had failed or broken across entire sections wherever the planks stood proud or the bungs popped in response to a gentle probe on port, and we will repeat the testing and same process on starboard next week. 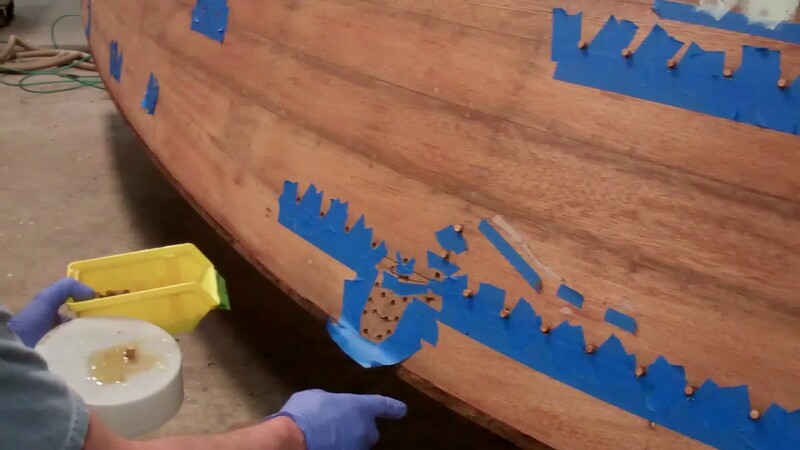 Additionally, as we reported some time ago, the port side requires old fairing compound “fixes” to be repaired properly with Dutchman patches. RJ and I will be proceeding with the final sanding and one more coat of CPES this coming week. Priming with fife coats of Interlux 2000E Epoxy barrier coat primer comes next, followed by applying two coats of Pettit Hard Racing Bronze bottom paint. Why only two coats of bottom paint? Applying more coats actually degrades adhesion. Apply two coats not, and then inspect the bottom after next fall’s haul-out, and apply a freshening coat then depending upon what your inspection tells you.